What are the iconic sights and sounds of the African bush? The honking of hippos at dusk; the eerie whoop of a hyaena under the soft glow of a full moon; or perhaps the bassy rumbling of a lion’s call as it echoes out across the savanna? These are iconic sounds of the night for sure, but what of the daylight hour? Birds dominate our auditory senses during the day as they scramble for perches from which to announce their intentions. The air is usually awash with this avian symphony and sometimes, such is their diversity, that they blur into one, becoming discernible to all but the keenest ear. But one, above all else sums up the African bush: the African Fish Eagle. Often seen surveying its favourite aquatic hunting grounds, the fish eagle ticks all the boxes for an icon: beautiful, majestic, imperious and formidable. To add to this, its unmistakable shrill call has become synonymous with the African bush. A sighting of this impressive raptor is always special but the bush likes to add to the drama at times and as we rounded a bend, she had laid on a special moment for us! In the drying mud of a seasonal pan, a fish eagle stood proud, its razor sharp talons gripping a barbell like a vice. Such was the size of its prize, it seems unsure of its next step and amused us for some time by comically dancing from A to B as it tried to decide on its next move. We wondered whether it would be a little too heavy for the raptor to take to the skies with its meal but nature’s power is immense and with a few muscular wing beats, it was airborne and heading for the safety of a nearby dead tree. Such is their strength, that 2 kg of fish can easily be carried into the blue to be devoured at a more suitable, and safe spot! 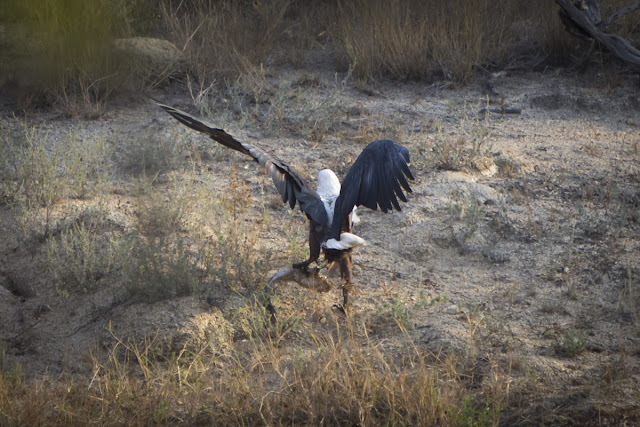 The fish eagle however seemed un-content with its choice of spot however and soon gave us a great display by launching from its perch and disappearing into the sky with the lifeless barbell still in its talons. Soon after, we found it again sitting alongside its mate but with no sign of the takeaway sushi. 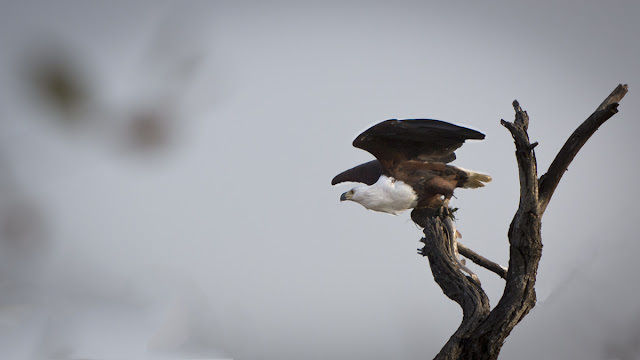 Non-migratory raptors such as the fish eagle breed during the dry season to avoid competition with its biannual visitors and will engage in courtship feeding where the male presents the female with gifts to cement their monogamous bond for the coming clutch. Perhaps this explains its reluctance to feed at the time and it was merely securing a nuptial gift for its mate? Whatever the thought process of the eagle, the sighting was spectacular. 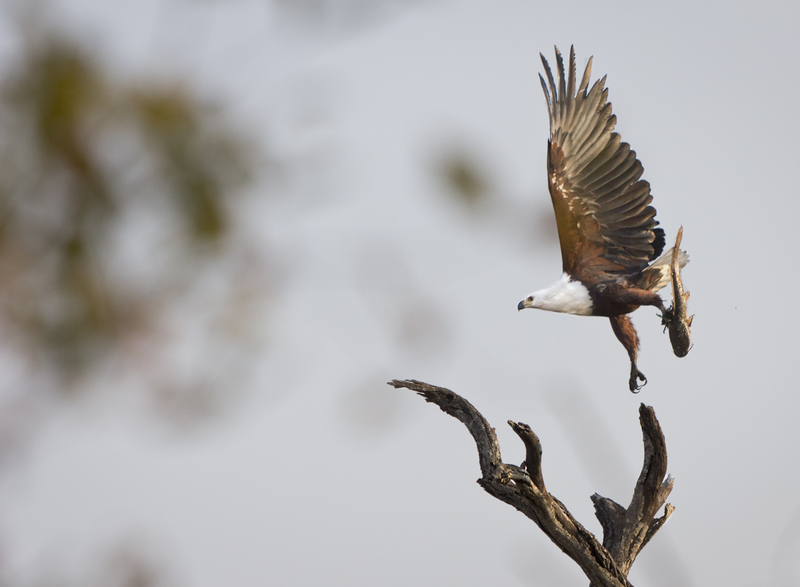 There is nothing more iconic in Africa than the sight of a fully grown fish eagle taking flight from a skeletal tree. 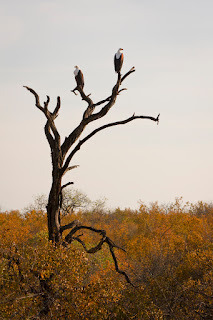 Contrasting chestnut and white being displayed twixt each wing beat is a breathtaking moment and one that every safari goer should experience!